I have so enjoyed Roseanna M. White's recent releases that I've slowly been making my way through her earlier works. I was not entirely sure what to expect with "A Stray Drop of Blood," but that was okay - once I got into the novel, every time I thought I had figured out what would happen next I was always wrong! That's some strong storytelling right there. Our heroine is Abigail, a young Hebrew slave who lives in Jerusalem. Her mistress is also Hebrew, while the master is a Roman soldier who believes in the One True God. Despite being a slave, Abigail is treated more like a daughter, loved and educated throughout her upbringing. Things shift drastically when the master's son Jason returns from Rome, having been away for several years. Seeing Abigail's beauty, he believes he must have her for himself, no matter the cost to Abigail or his parents. Tensions run high in Jerusalem as the words of the teacher Jesus are much reported, and Barabbas wreaks havoc in the streets as he leads an uprising. From the fateful Passover day that changed the course of the world to the beginning of the church in Rome, Abigail's tumultuous journey will keep you glued to the pages. This book does not shy away from the debauchery of the times, so I would not recommend it for readers under 18 years of age. If sexual assault or abuse is a trigger I would also caution readers to look elsewhere. For a technical note on the writing, I found the vast number of point of view characters to be a different approach. In general I do not prefer to have so many come and go, though it helped with the suspense of never knowing which direction this story would turn. Overall this book was quite reminiscent of a classic story I loved as a teenager: "The Robe" by Lloyd C. Douglas. I would recommend "A Stray Drop of Blood" for adult readers who enjoy Biblical fiction or looking into life as it might have been at the time of Jesus. Willa Forsythe plays the violin by ear - but only to her friends and family. That's partially because her family is a collection of London orphans who have banded together to form a group of highy experienced thieves, and therefore secrecy is highly desirable. After her sister Rosemary's success in providing information for mysterious government contact Mr. V, the family is all set to lay aside petty thievery and focus on tasks that actually help Britain in The Great War. When Mr. V contacts Willa and asks her to retrieve a cypher key from famous violinist Lukas De Wilde, Willa can hardly believe it. She's admired Mr. De Wilde's work for so long and has even heard him play before! Now with both British and German agents seeking his deceased father's famous cypher, Willa is under scrutiny to find it and report back to Mr. V as quickly as she can without arousing suspicion. After barely suriviving the German attack on his home, Lukas De Wilde finds himself in Wales with other Belgian refugees. Worried sick about his mother and sister, Lukas is determined to make it back and find them as soon as he is able. Meanwhile he must play with the refugee orchestra and raise funds to help those still in their war-torn country. When Lukas and Willa meet, he is captivated from the moment he allows her to play his Stradivarius. He can't believe someone with her talent has never had lessons and taught herself to read music. He would do anything to help her further her abilities, even though he knows that she will eclipse him if her proficiency becomes known. He's never met anyone more fascinating, or more guarded, or more determined to not to let their relationship develop a romantic side. While Willa cannot believe Lukas De Wilde has actually taken notice of her, she works hard to fulfill her job for Mr. V - and doubly hard to make sure her heart does not become entangled. She can't fall in love with Lukas, because romantic love has only caused people to abandon her. But she does care for him, and when it becomes clear that his life is in danger because of the secrets he carries with him, she's willing to risk her life to save his. This is a wonderful story that will have readers racing through the pages. I thought the faith aspect was well done, showing both the power of redemption and the realistic reasons that Willa would hold God at arm's length. The adventure is exciting, and the history thoroughly researched. 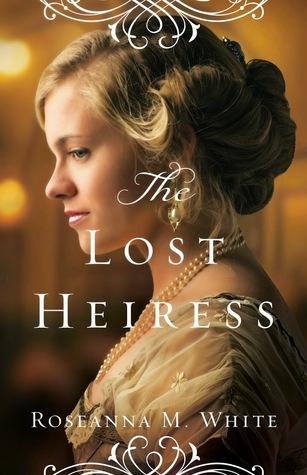 Another Roseanna M. White novel that I recommend for all history fans! It's 1914 in England and loyalties are being questioned as Europe braces for war. Peter Holstein is under suspicion of being a spy due to his German heritage and his friendship with the British monarchy. This peaceful man with a stuttering tongue has done nothing to endanger his country, but he does have secrets. He's a novelist publishing under the name Branok Hollow, and he keeps to himself to have plenty of time to write letters and tinker with his current manuscript. Rosemary Gresham grew up a London street urchin and has done what it takes to survive. Now an accomplished thief, Rosemary delights in the challenge of each new and difficult job she's hired to do. When the mysterious and well-paying Mr. V secures her services to prove Peter Holstein has ties to Germany, Rosemary sets off for his Cornwall estate to pass herself off as a librarian. While Peter is thrilled to have help putting his family's papers in order, Rosemary is ever mindful of the information she is seeking to uncover for Mr. V. The Holstein family have been book hoarders for years, and Rosemary's task is no small one. Her curiosity grows as she observes Peter locked in his study day after day, where she can hear him using his typewriter for hours at a time. What is he typing? While Rosemary finds Peter a kind and gentle man, he comes under more suspicion every day and pressure mounts for her to produce the evidence of where his allegiance lies. This was a fun and captivating novel! I enjoyed the glimpse into this particular time in history and the real historical figures who make appearances. Roseanna M. White's new Shadows Over England series is off to a promising start. Book 2 releases in January! I received my copy of the book from LitFuse Publicity. All opinions in this review are my own. If you would like to see what other people are saying about "A Name Unknown," click here.